After seven years of gardening in the Midi in southern France we’re beginning to learn from other gardeners around us and from our own mistakes. This is the journal of our garden, our cooking and the food and wine we buy locally here in the Languedoc. Chaiselongue plans, plants, harvests and cooks. 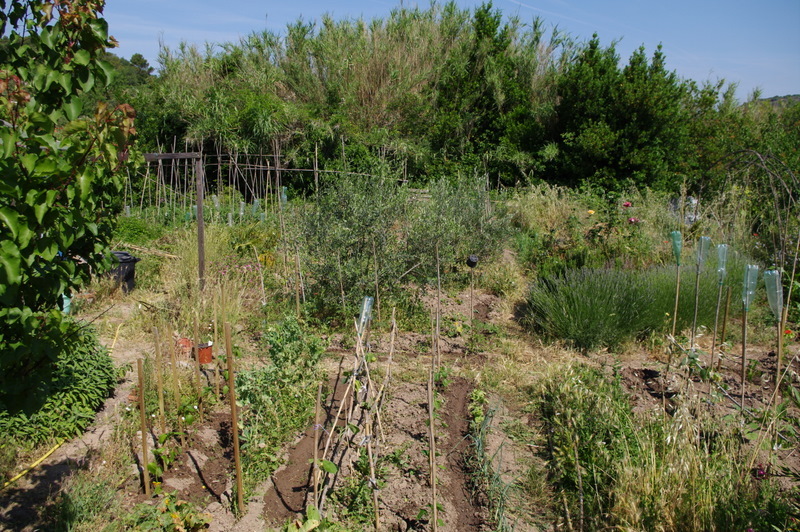 Lo Jardinièr (the gardener in Occitan) does most of the hard work – and cooks too. But most of all we enjoy our life in a village surrounded by vineyards, olive trees and garrigue-covered hills where the sun shines for 300 days a year. Lo Jardinièr also has his own blog about the wildflowers of the Languedoc….and jazz too – it’s an entangled bank. In the old part of the village where we live the houses are in narrow streets too close together to have gardens. For centuries the gardens have been on a hill just outside the village with a spring, La Resclauze, at the top. After the rainy months in spring a stream runs downhill past the gardens, giving us welcome free water for our plots. When the stream dries up again, usually around the end of June, we have to start to rely again on metered water. In this Mediterranean climate water is a constant concern and we try to use it as efficiently as possible. Any ornamental plants we put in the garden are watered for the first year while they settle in but after that they have to survive on their own, so we choose varieties that are drought-resistant, mostly the Mediterranean spring- and autumn- flowering plants like cistus, lavender, irises, that grow here in the wild. As well as working there to grow as much of our own food as we can, we use our garden as part of our home, eating meals there throughout the year, and especially in summer where we spend whole days there sheltering in the hottest hours around the middle of the day under vines and climbing roses on our terrace. Beautiful garden area! I live in the United States. Texas, in fact. I’m excited to follow the progress of your gardening. Thank you for visiting my blog; I appreciate it. Your blog is just beautiful. WordPress thinks that your Internet service provider is in Montpellier, a place I visited a long time ago when I had a French pen pal from high school through college. I remember that her father spoke French with a southern pronunciation that may owe something to Occitan. Many thanks for thinking of me as a recipient of this award. I won’t pass it on though, as I have decided not to participate in these kinds of blog awards. I’m glad you enjoy my blog!